The. Best. Trash. Can. Ever. The Community Compass art project delivered its latest creation to the schoolyard at St. Joseph’s A. McKay Elementary last week. Dubbed the Trashinator, it is a glittering and colourful sleeve that fits over the oil-barrel styled trash can at the school. Silk-screened shingles and re-purposed plastic lids and packaging make up the skin. 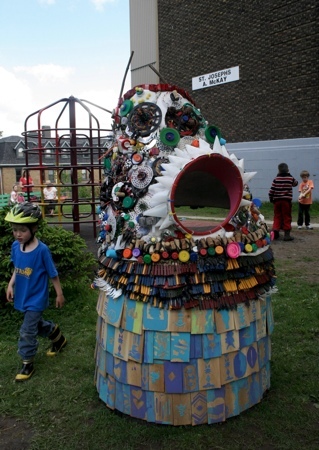 Each element was designed and assembled by students and neighbours at workshops held at the school over the past month. Trashinator, which sits on the Kaye Street side of the school, will soon be joined by a companion piece that will cover the school’s other outside garbage can. Click here for more information on Community Compass.